Average temperature in the far north has warmed double the rest of the planet because snow reflects almost all of the sun’s energy back into space. When snow melts, that energy is absorbed resulting in more warming than other places. White areas are “no data.” From UKMet. Several things are at play here. First, it’s winter. It’s far colder in winter than the warming we have experienced. So when it’s winter it’s cold, relative to when it’s not winter. But a little warming can’t be that bad, right?Our global ecology evolved in a different climate than we have today. This means plants and animals are stressed and more susceptible to disease and insects. Across the planet forests are dying because they cannot survive in a warmer climate. If forests could migrate, things would be different. Instead they die. New trees may survive for a while because the young are vigorous, but as they mature they succumb even faster than their predecessors because it’s even warmer. Even more importantly, it’s not the averages, it’s the extremes like Harvey and the California fires and the recent California drought and the 2011 Texas Oklahoma drought, and even flooding kills trees. In Texas, the 2011 drought killed over 300 million trees and stressed far more by singeing off the little root hairs that take up water. Widespread flooding in the spring of 2015 and 2016 saturated soils and the already stressed forests were attacked by fungus in soils and advantageous insect infestations resulting in what is likely tens of million of additional tree deaths. These attacks continue because the trees are still stressed. It takes decades to generations for the little root hairs to grow back. Another example how a little warming creates a lot of hurt, is the pine bark beetle that has ravaged 89 million acres of western North American forests. Temperatures of -40 for two weeks in mid-winter can kill the beetle and at high altitudes where the beetle is rampant, it did get this cold back before 2000. In the past, individual beetle attacks could have killed as many as 4 or 5 million acres. 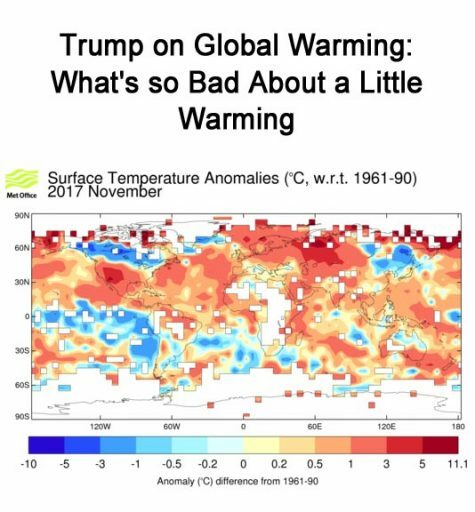 But since 2000, 40 below temperatures have vanished, and it’s because high altitudes warm just like the Arctic because of snow melt. Snow reflects up to 90 percent of the sun’s warmth back into space but dirt, plants or water absorb 90 percent. So a little melt creates a lot of warming and that warming then creates even more melt in a feedback loop. Without 40 degree below zero cold, these beetles proliferate. December 29, 2017 Global Temperature: It can be 50 degrees colder — easy — in the Arctic, than it is in the U.S. So even if the Arctic has warmed 20 degrees, it’s still bitterly cold when the jet stream tears off a big chunk of cold air and sends it south. It’s winter. Click on image to link to high res. It’s such a simple thing. It’s cold in winter so a little warming doesn’t mean it’s always summertime in winter. The Arctic can be 50 degrees colder than latitudes where most people live with the actual temperature of -50 degrees or even colder in the Arctic. As shown in the first image above, in November 2017, warming in some places in the far north was up to 20 degrees F (11 degrees C) warmer than normal. So even with warming of 20 degrees above normal, it is still -20 to -30 degrees below zero in the far north. Warming causes the jet stream to have bigger loops that travel more slowly west to east across the planet. This effect is the famous “polar vortex” we hear about whenever we get a snowmageddon. See here for a detailed discussion of the most recent science from March 2017 about how arctic amplification happens. 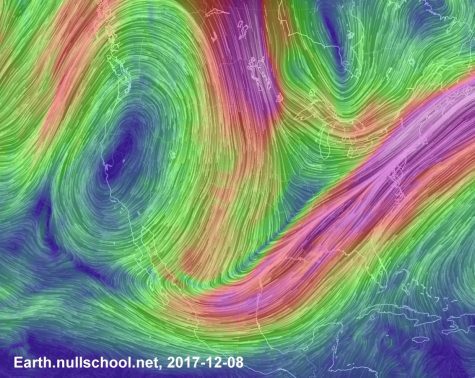 This image shows a powerfully amplified loop in the jet stream on December 8, 2017. This is when Austin had a couple of inches of snow–very rare for Austin. You can see the current jet stream pattern by clicking on the above image. What this means is that the jet stream can tear off a big blob of arctic air and move it even father south than in our old climate. 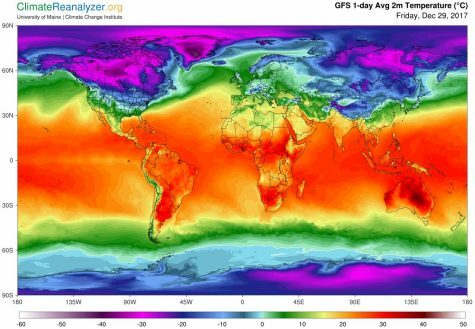 So if this blob is even 20 degrees warmer than usual, it’s still bitterly cold and because the jet stream is sucking that cold air even farther south, we can even set cold temperature records — on a warmer world.